The Sheep Rock Visitor Center is on Highway 19 between the towns of Dayville and Kimberly. Sheep Rock, soars 1,100 ft above the John Day River, and gives its name to this unit of the John Day Fossil Beds. There are several hiking trails and wayside exhibits, two picnic areas, and two interpretive facilities. The The Thomas Condon Paleontology Center features exhibits and interpretive programs on the fossils, geology, and the paleontology of the area. The historic Cant Ranch house features an exhibit on cultural history of the John Day Valley. The Cant Ranch Museum, is the headquarters for the monument and contains exhibits on the history of human settlement in the area. This 9,000 acre working cattle ranch is rich in history and love with seven pristine dude ranch style guest rooms. Your hosts are Phil and Nancy Wilson are fifth generation Oregonians, whose families homesteaded in Wheeler and Gilliam Counties over 100 years ago. We guarantee Joy for the Heart, Peace for the Soul, and Memories for a Lifetime! 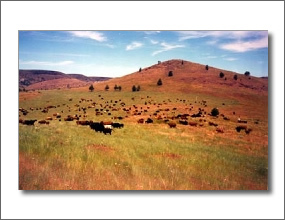 The Painted Hills Unit is 9 miles northwest of Mitchell, off Highway 26. 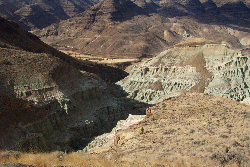 The Clarno Unit is 20 miles west of Fossil on Highway 218.